Deciding the types of snacks to include in your child’s lunch bag can be a difficult decision. Many children ask for cookies and chips, but these snacks do not provide adequate nutrition for growing children. Teaching a child healthy snacking habits now can help set him up for a lifetime of healthy eating. There are many healthy options for a school-day snack. 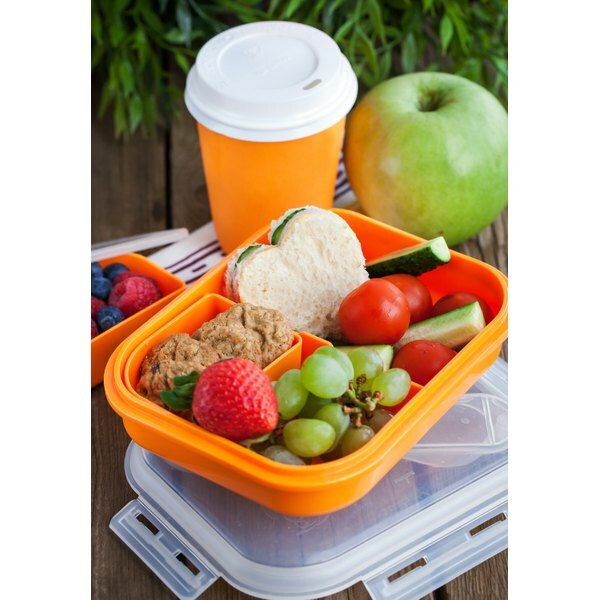 Packing vegetables and fruits in your child’s lunch provides her with many essential vitamins, minerals, phytochemicals and fiber. These nutrients are important for the immune system and gastrointestinal health. Vegetables and fruits are low in calories, fat, and sodium, making them a healthy snack choice. Low-fat dairy products, such as yogurt, and low-fat cheese, such as string cheese, are healthy additions to any lunch. These snacks provide your child with calcium, which is essential during adolescence for the development of strong bones and teeth. Sliced cheese can be served with multi-grain crackers for additional protein, B vitamins and fiber. Nuts and trail mix are a healthy snack option. Nuts and seeds provide antioxidant vitamins and healthy monounsaturated fat. Dried fruits, such as raisins, cranberries and cherries, can be added to any nut mix to boost its vitamin content. Parents should use caution while sending children to school with nuts, due to the growing number of children with nut allergies, who may be affected. Whole-grain snacks provide school children with protein, fiber and B vitamins. Healthy whole-grain snacks include rice cakes, crackers, popcorn, granola bars and whole-grain pretzels and baked tortilla chips. Check the ingredient list to avoid products that contain artificial ingredients or preservatives.